We are one the well-known manufacturers, exporters and suppliers of Two Bottle Jute Wine Bags. 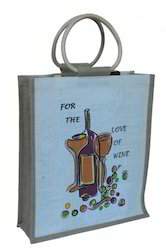 The offered two bottle jute wine bags are specially designed for holding two wine bottles of standard size. Our supplied two bottle jute wine bags are commonly used at the wine shops and wine outlets.